So anyway, my friend Bronson and I recently headed over to Alumnae Theatre to see August: Osage County after getting a tip from a colleague. Neither of us were familiar with the play before the tip, and we both felt a bit like a couple of Toronto bumpkins after finding out that the play resulted in a Pulitzer Prize for playwright Tracy Letts in 2008, and was also made into a movie starring Hollywood heavyweights Meryl Streep and Julia Roberts. How big are the rocks we were living under, right? The premise of August: Osage County is that of a family coming together after its patriarch commits suicide. Played by Thomas Gough, I would have loved to have seen more of his character, Beverly Weston. In the one scene we see him in, he is an old, alcoholic poet. Crusty yet engaging, we meet Beverly as he is in the process of hiring a live-in caregiver. He offers a book of T. S. Eliot poetry to a maid as a way of offering her a job. From a certain perspective, it might seem like Beverly is hiring a younger woman to replace his wife. From more charitable perspective, however, perhaps he is hiring the maid to look after his drug addicted wife after he decides to make his last curtain call. After Beverly departs, his three daughters and their *ahem* baggage re-assemble at his mansion in rural Oklahoma. Tensions, craziness and intrigue eventually run even higher than the August temperature, which typically hovers around 100° F in Osage County. In other words, it’s steamy on a lot of different levels. August: Osage County is a character-driven play, and lots of elements go into making it a successful one. For example, the minimal set does a fine job of depicting the homestead, while at the same time allowing the cast of 13 to flex their acting muscles. I suppose this production of August: Osage County is not unlike a radio play in some regards. Part of what I mean by that is that the set’s simplicity allows for the audience to reflect and imagine, to “fill in the blanks”. That’s what August: Osage County felt like to me: having a holiday dinner with my in-laws. I was an audience member watching this play at The Alumnae Theatre, but I was closer to the characters onstage than I ever was with my in-laws in real life. In case you haven’t guessed already, it is difficult to review August: Osage County without being a “spoiler”. There’s one plot twist after another, one darkly comedic line delivered with precision after another. There are soap opera elements, but they are closer to Coronation Street than any of the American varieties of daytime television. I could relate to all characters on a certain level in this play, because again, this is Pulitzer Prize winning writing coupled with excellent acting by this Toronto cast. During intermission Bronson and I agreed that we could immediately tell that the writing was superb. We also agreed that it took a bit of time for the actors to catch up with the writing. Eventually though, August: Osage County “came together”, and we felt at one with the play. The play runs a bit longer than most, coming in at 2 ½ hours. Don’t be put off by the duration: time flew for us and we felt like our sojourn to Oklahoma was way too brief. I suppose attending this play is a bit like watching a marathon of one of your favourite shows. There are enough plot twists and subplots to keep even those with the shortest attention spans interested. On the streetcar on the way home, Bronson and I discussed which characters we connected with most. We identified with ones who were strong, complex and realistic, two of whom just happened to be women. Bronson thought that Violet Weston (Marie Carriere Gleason) reminded her of her recently deceased grandmother. I could most relate to the character Barbara Fordham (Kelly-Marie Murtha), who conjured up memories of my late wife. We parted ways for the evening, but not before agreeing again: August: Osage County is a play worthy of repeated viewings. Go see it for yourself and let me know what you think. The box office opens one hour before the show for cash purchases. The Alumnae box office does not accept credit/debit at the door. 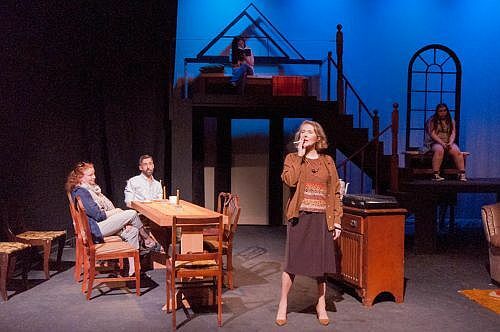 Photo of the cast of August: Osage County by Bruce Peters. What a great review! I love your very natural writing style and now I am definitely going to see this production. I was planning to go anyway but this review just cemented that plan. I agree. Really nice review. Look forward to seeing this play and reading more reviews by you, Mr. Perry!